she is getting so big, i cant believe it! shes adorable. awe! she is so cute. Oooh, can I borrow yours, lol? Super adorable! seriously, the cuteness is KILLING me!! so great! Oh my! She is seriously the cutest little thing evah!! awwww, can I borrow her??? Soooo precious!!! Please pinch those cheeks for me! i thought this was a picture of those dolls…then i scrolled to see cute Soul in a basket!! i totally agree! but i don't have a baby….can i borrow yours? heheh! she's soooo adorable! and they smell just as good. 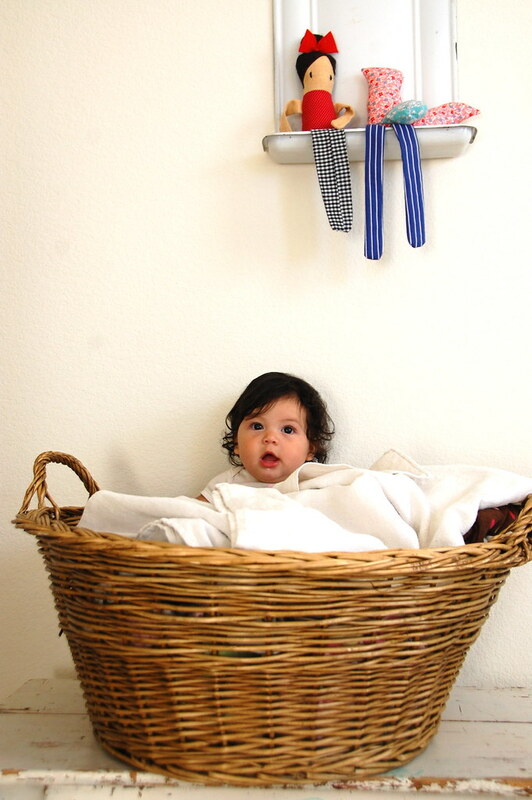 hmm… hang this picture in/near the laundry ain't such a bad idea! i think this is you good inspiration to do and put away laundry. you all are too smart! Awwww he looks so comfortable among the laundry but its definitely not where he's supposed to be. I want to hug her! She's such a little darling. Also: that wall is the loveliest colour. Look how much she has grown. I visit your blog probably once a month? Sometimes more often, but wow…it's like I've seen her grow just through your wonderful photos.